Matthews was part of the same Leeds United Youth team which produced full internationals Harry Kewell, Stephen McPhail, Alan Maybury, Matthew Jones, Jonathan Woodgate and Paul Robinson. A bright future was predicted for him as he was an integral part of the team that lifted the FA Youth Cup in 1996-97, with Matthews getting the winner in the away leg of the final at Crystal Palace, and many, including Matthews, were in the Leeds Reserve team that took out the Pontin’s League crown the following season, 1997-98. In that season Matthew did make the first team, coming off the bench on three occasions. He came on for Jimmy-Floyd Hasselbaink four minutes from the end at Crystal Palace on 31st January 1998, and then he had another four minutes as Alan Maybury’s replacement in the home game with Southampton on 28th February 1998, followed in the next game at home to Tottenham Hotspur with one minute in the place of Jimmy-Floyd Hasselbaink. He was also an unused substitute on six other occasions that season. After that he had injury problems and slipped down the pecking order as Alan Smith emerged and Tony Hackworth came into the reserves, and several strikers were brought in to bolster the Leeds strike force. He was loaned out to Notts County for a month in October 1998 and had four starts and one game from the bench. 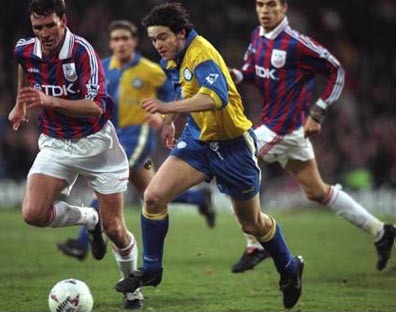 Then he went Gillingham in March 2000 for two months and made two starts and three games from the bench. In March 2001 he went on loan and scored in his first game which was from the bench and it came as little surprise when he was allowed to sign permanently for £100,000. His City career started fairly promisingly, but injury struck in September 2002, and he struggled to regain his first-team place after recovering. He went on loan to Darlington in December 2003 for a month, scoring once in six appearances. On his return he went immediately on loan to Bristol Rovers for two months, where he made nine appearances without scoring followed immediately by being loaned to Yeovil Town until the end of the season in May 2004, failing to score in two starts and two games off the bench. After these loan spells, he moved on to Port Vale on a free-transfer in June 2004. While with Bristol City, he scored eight League goals from fourteen starts and twenty–eight substitute appearances. He scored three times in two starts and nine games off the bench in other competitions. He was with Port Vale, for two seasons and scored ten League goals from twenty-one starts and thirteen substitute appearances and he played one League Cup game without scoring. In August 2006 he joined Crewe Alexandra but he struggled to break into the first-team at Gresty Road, all of his ten appearances coming from the bench, and he left the club after one season, with no goals to his name. He joined Scottish club Livingston on 16th August 2007, but left at the end of the season after three League starts and two more from the bench without scoring.He retired at the age of twenty-eight when he found it impossible to maintain a level of match fitness. He became a football agent.